This tool joins frames simply and accurately. It's ideal for all skill levels. Use it on hardwood or softwood moldings up to 2-1/2" wide. It features a quick depth setting adjustment that drives all V-nail sizes. 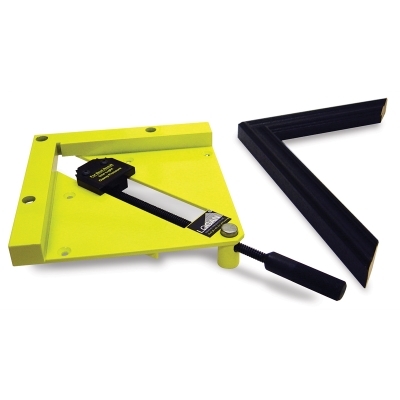 Speed up the time it takes to join picture frame sections with this handy accessory to the Logan Studio Framing Joiner. The vise allows users to glue and set two corners at a time in preparation for inserting v-nails. Use on mouldings up to 2-1/2” wide. Includes a quick-adjust clamp. Fully assembled.